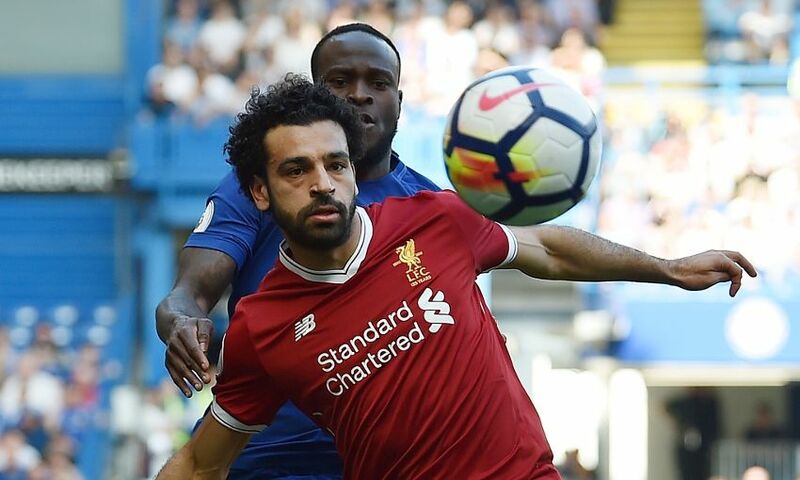 Liverpool's pursuit of a top-four finish could go to the final day of the Premier League season after they were beaten 1-0 by Chelsea at Stamford Bridge on Sunday. The home side grabbed the game’s only goal on 32 minutes as Olivier Giroud glanced in with his head from Victor Moses’s delivery. The Reds saw plenty of possession, but were unable to find a breakthrough against a resolute Blues defence. The result means Liverpool may need to defeat Brighton & Hove Albion at Anfield next Sunday if Chelsea prevail against Huddersfield Town on Wednesday. If the race goes to the final day, a win for the Reds should suffice due to their superior goal difference to the Blues. One change was made to Liverpool’s starting line-up as Nathaniel Clyne came in for Jordan Henderson, who moved to the bench. Trent Alexander-Arnold began in a midfield role. Liverpool started the sun-drenched contest knowing a point would all but secure a top-four finish for a second consecutive season, while a victory would confirm it. Chelsea, meanwhile, had designs on closing the gap on the Reds and fourth-placed Tottenham. The visitors registered the game’s first effort following a sustained spell of possession as Roberto Firmino’s dart in behind was picked out by Alexander-Arnold’s ball forward, but the Brazilian’s attempt from a tight angle was kept out by Thibaut Courtois. Liverpool were largely in control of the ball, though they were thankful for Giroud and Tiemoue Bakayoko getting in each other’s way from Eden Hazard’s pull-back. Mane then scooped over from Clyne’s low delivery before the forward stung the palms of Courtois with a left-foot blast from 20 yards that the Chelsea ‘keeper needed to push around the post. On the half-hour, Mane threatened once more as Andy Robertson headed up a counter-attack before laying the ball off to the frontman. His initial drive was parried and when the ball was worked back to him by Firmino, a toe-poke towards the bottom corner was also kept out by Courtois. Two minutes later, Chelsea took the lead as Moses’s cross from the left took a deflection into the vicinity of Giroud, who glanced beyond Loris Karius from close range. And the Blues could have furthered their advantage soon after, but Cesc Fabregas drove across the face of goal and wide, meaning the teams would conclude the opening half with one goal separating them. Chelsea carved out opportunities to net a second in the immediate stages following the re-start. First, Moses flashed inches wide of the far post after being found in space in the area before Hazard’s wriggle into a shooting position needed a stop from Karius to keep it out. Henderson replaced Clyne on 58 minutes as Liverpool began to reclaim more possession, while Dominic Solanke came on for Robertson. But the Reds were finding opportunities difficult to come by as Marcos Alonso arrowed a superbly executed volley just off target for the home side. Solanke headed over and Virgil van Dijk nodded down and into Courtois’ gloves in stoppage-time as Chelsea held out for the win that ensures the top-four race could go to the wire.